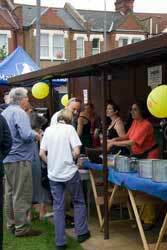 The animal shelter fun day held at the Mayhew animal rescue centre, North London, was held on Sunday 15th July. We had heard a lot about the Mayhew Animal rescue centre and it’s long history of rescuing unwanted animals. The home first opened its doors during the reign of Queen Victoria in 1886. So when we heard that they were holding an fun day, we decided to go along and take a look for ourselves. The shelter is about an hours drive from where we live, so we jumped in the car and kept our fingers crossed that the weather would stay ok. Even though it is July, London hasn’t seen much of the sunny weather this year and many events have been completely washed out. The last thing we wanted was for the animal shelter fun day to be ruined. When we reached the shelter everything was already in full swing. They had set up a row of stalls outside in the street selling a range of animal related items such as greeting cards and animal toys etc. There was even a bouncy castle, which even though I’m 40 I’m always tempted to have ago on (I chickened out). 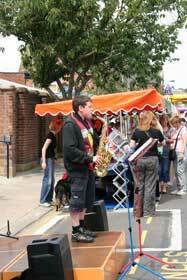 A music stage had been set up and when we arrived a teenage boy was playing the saxophone, very well I might add. It really gave the whole event a great atmosphere. Inside the building the fun day continued and for a small fee you could wander freely around the home and visit all the animals that were looking for homes. We were very impressed by all the modern facilities at the shelter, which included very clean and spacious animal enclosures, an operating theatre, recovery rooms, play areas, veterinary surgery and education rooms. The place was already packed full of visitors and walking around was becoming quite a slow process. Especially when one of their very large dogs was led around with collecting tins on his back. What a squeeze, but what fun. During the day they held several talks, which were free to attend. 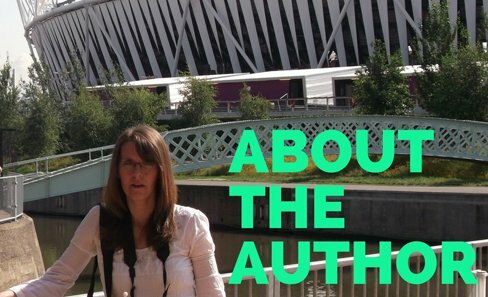 The first was about cat massage, and the Telling Touch Training technique that was given by Jacqui Carter. 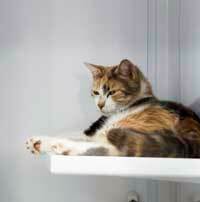 This is a method of training your cat, which incorporates bodywork and ground exercises. We had never come across this before but we both found it very interesting to hear about. The other talk was about cat grooming, which was given by Pet Universe. With the help of two lovely cats who were willing to allow their fur to be groomed (both were cats looking for homes), we were shown how to brush both short and long fur correctly and told how to care for our cat’s ears and eyes. Everyone really enjoyed watching the cats lap up all the attention and the demonstrator was very good at being gentle with the cats. By this time we were getting peckish, so we made our way outside into the garden where they were serving a vegetarian bbq, homemade cakes and even wine and beer. Now that’s what we call an animal shelter fun day. Everything was delicious and very cheap to buy and by mid afternoon I think they had sold out of nearly everything. What a fantastic way to top up their donations. A great day was had by all I would say and I would very much recommend that if you live in the area that you take a look at the Mayhew Animal Shelter website to check out their future events. Well done everyone at the Mayhew centre and thanks for a great day out. Keep up all the good work.